The idea of a plaza as a geographic center of a community dates back to ancient times, making Socorro’s Plaza a testimony to historic custom and culture, as evidenced by its proximity to San Miguel Church. Kittrel Park, in the center of the plaza, is named for a local dentist who first planted grass and trees. He is said to be buried there. 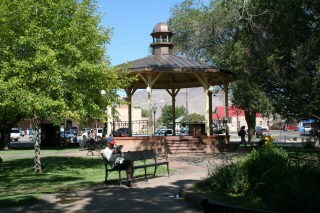 Socorro’s Plaza remains a center of community activities, as well as a repository for a piece of the structure that housed the first atomic bomb detonated at Trinity Site. Shopping, events and entertainment are all available downtown.